Pope Benedict XVI delivers his "Urbi et Orbi" (to the City and to the World) speech from the central loggia of St. Peter's Basilica on Christmas Day. Pope Benedict XVI wished Christmas peace to the world Tuesday, decrying the slaughter of the "defenseless" in Syria and urging Israelis and Palestinians to find the courage to negotiate. 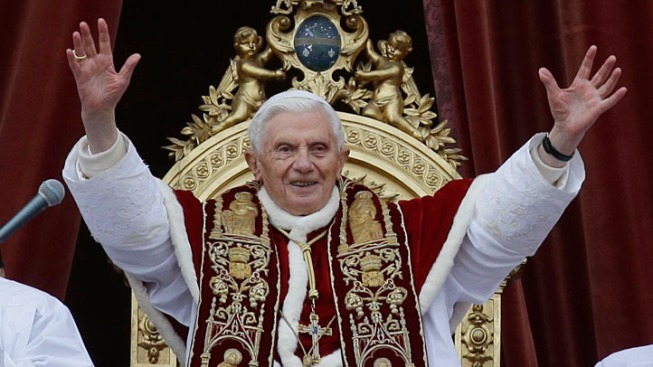 Delivering the Vatican's traditional Christmas day message from the central balcony of St. Peter's Basilica, Benedict also encouraged Arab spring nations, especially Egypt, to build just and respectful societies. He prayed that China's new leaders respect religion, a reference to persecution Chinese Roman Catholics have at times endured under communism. As the 85-year-old pontiff, bundled up in an ermine-trimmed red cape, gingerly stepped foot on the balcony, the pilgrims, tourists and Romans below backing St. Peter's Square erupted in cheers. In his "Urbi et Orbi" speech, which traditionally reviews world events and global challenges, Benedict prayed that "peace spring up for the people of Syria, deeply wounded and divided by a conflict that does not spare even the defenseless and reaps innocent victims." He called for easier access to help refugees and for "dialogue in the pursuit of a political solution to the conflict." Benedict prayed that God "grant Israelis and Palestinians courage to end long years of conflict and division, and to embark resolutely on the path to negotiation." Overcast skies and a cold wind in the Holy Land didn't dampen the spirits of worshippers in the biblical West Bank town. Bells pealed and long lines formed inside the fourth-century Church of the Nativity complex as Christian faithful waited to see the grotto that is Jesus' traditional birthplace. Duncan Hardock, 24, a writer from MacLean, Va., traveled to Bethlehem from the republic of Georgia, where he had been teaching English. After passing through the separation barrier Israel built to ward off West Bank attackers, he walked to Bethlehem's Manger Square where the church stands. "I feel we got to see both sides of Bethlehem in a really short period of time," Hardock said. "On our walk from the wall, we got to see the lonesome, closed side of Bethlehem ... But the moment we got into town, we're suddenly in the middle of the party." For those who couldn't fit into the cavernous Bethlehem church, a loudspeaker outside broadcast the Christmas day service to hundreds of faithful in the square. Their Palestinian hosts, who welcome this holiday as the high point of their city's year, were especially joyous this season, proud of the United Nations' recognition of an independent state of Palestine just last month. Back at the Vatican, Benedict offered encouragement to countries after the Arab spring of democracy protests. He had a special word for Egypt, "blessed by the childhood of Jesus." Without citing the tumultuous politics and clashes in the region, he urged the North African region to build societies "founded on justice and respect for the dignity of every person." Benedict prayed for the return of peace in Mali and harmony in Nigeria, where, he recalled "savage acts of terrorism continue to reap victims, particularly among Christians." He also recalled the problems of refugees from fighting in the Democratic Republic of Congo and decried brutal attacks hitting places of worship in Kenya. The Vatican for decades has been worried about the well-being of its flock in China, who are loyal to the pope in defiance of the communist's government support of an officially sponsored church, and relations between Beijing and the Holy See are often tense. Speaking about China's newly installed regime leaders, Benedict expressed hope that "they will esteem the contribution of the religions, in respect for each other, in such a way that they can help to build a fraternal society for the benefit of that noble people and of the whole world." Acknowledging Latin America's predominant Christian population, he urged government leaders to carry out commitments to development and to fighting organized crime.